High-grade and firm boar bristle allows this brush to smooth out tangles, quick wet and fast dry. Two-headed bamboo comb, can be used to comb thick or thin beard as well as hair. Combination of brush & bamboo comb can meet you different demands, convenient to use. PERFECT GIFT – If he has a beard, moustache or goatee, he’ll love our set! It’s the perfect Christmas, Father’s Day gift or birthday gift for men. Buy now and get our 100% satisfaction guaranteed! BEARD GROOMING KIT for a well maintained beard and moustache. Travel size set for a bearded explorer in a PREMIUM GIFT BOX. 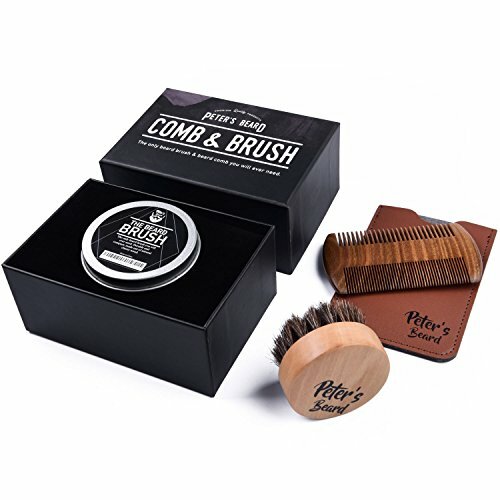 Set includes an oval shape palm fitting black BEARD BRUSH, a unique specially for men designed small black MOUSTACHE BRUSH and a compact WOODEN DETANGLING COMB. To help keep them at hand, included is a cotton carry bag. NATURAL SOFT BOAR HAIR. Facial hair needs antistatic, no-pull, no-snag tools to get that hot groomed ultra manly look. Brushes are 100% BOAR BRISTLES which distribute oils, groom and smooth naturally and promote beard health. Because there are no mixed nylon bristles, all is natural and stiffness is soft/medium. 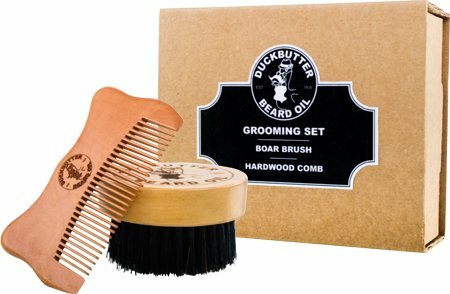 HEAD HAIR, BEARDS & MUSTACHES – will all benefit from this natural wooden comb and 100% boar bristle beard brush set. Works great on any type of hair including long, short, thick, thin, soft, firm, coarse and tangled beard hair. 100% BOAR BRISTLE BEARD BRUSH – natural boar bristles help distribute oil, improve hard hair texture, styling, shaping, smoothing and conditioning. Great used with beard oils, balms, waxes & conditioners. Ideal for firm beard and stache grooming, softening and styling. HANDMADE, ANTI STATIC & SNAG FREE – each comb is crafted with the tender care that will leave your hair feeling smooth at any given time. Thick fine tooth finish that can get through any viking hard hair or beard, assuring no snagging or hair pulling like other cheaply made plastic combs. Great as a moustache comb, and helps maintain dandruff free facial hair. 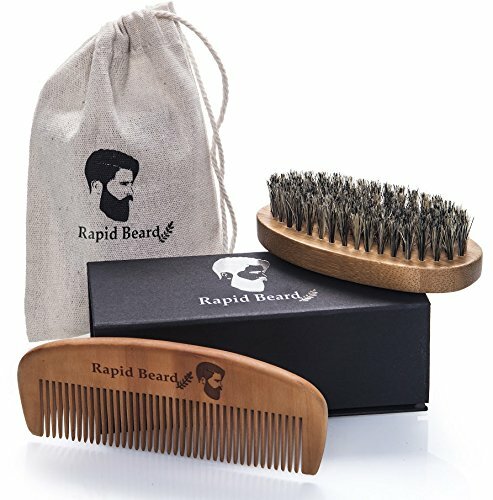 HEAD HAIR, BEARDS & MUSTACHES – will all benefit from this natural wooden comb and 100% boar bristle beard brush for men. Works great on any type of hair including long, short, thick, coarse and tangled beard hair. 100% BOAR BRISTLE BRUSH – natural boar bristles help distribute oil, improve hair texture & massage scalp. Great used with beard oils, balms, waxes & conditioners. Ideal for beard grooming, softening and styling. HANDEMADE, ANTI STATIC & SNAG FREE – each comb is crafted with the tender care that will leave your hair feeling smooth at any given time. Thick fine tooth finish that can get through any hair or beard, assuring no snagging or hair pulling like other cheaply made plastic combs. Great as a mustache comb too. Easily for striking look: Ensure you receive great results when it comes to shaping, styling and simply grooming your facial hair. Natural boar bristle brush: This brush contains no synthetic filler bristles that could detach in your beard, or irritate the skin underneath. Whether your facial hair is short or long in length, this brush will have you looking your best with ease. Clears residue: You don¡¯t want to be caught in public with crumbs, dirt or anything else stuck in your moustache or beard, and with this brush you don¡¯t have to worry about that. Premium wooden brushes like this are essential for any man that wants a nice beard. 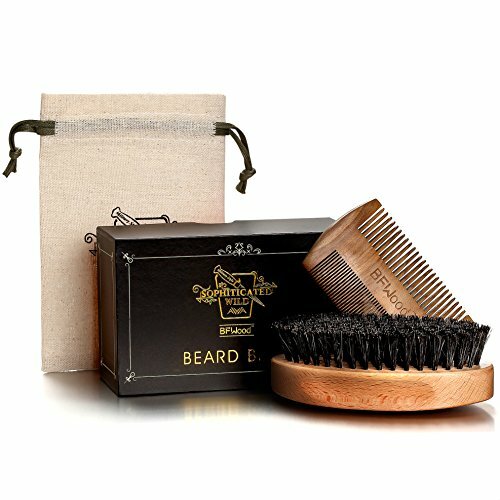 BOXED GIFT SET – The perfect gift for your favorite beardsman! 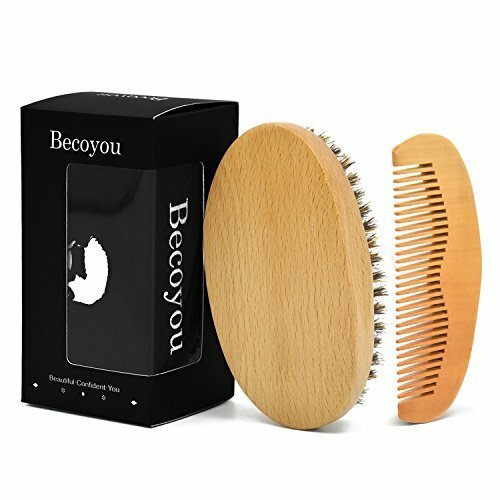 GENUINE PEACH WOOD COMB – Used for centuries in Ayurvedic & Chinese medicine, peach wood is a symbol of health & longevity. NATURAL BOAR BRISTLE BRUSH – 2.25 cm Medium Texture boar bristles are ideal for facial hair grooming. BEST MEN’S GROOMING GIFT SET: Presented in high quality gift boxes, our beard care tool kit is perfect for birthdays and Christmas. 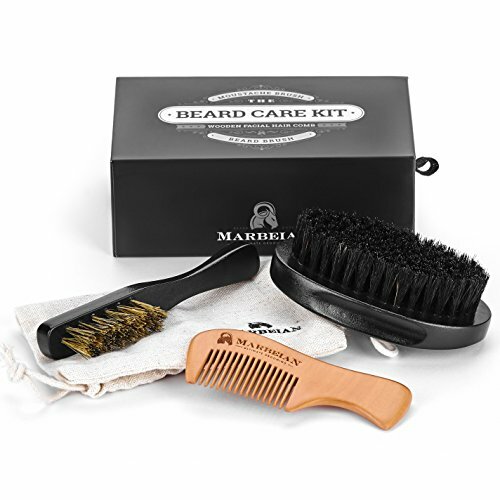 STYLING, MADE SIMPLE: Our brush and comb kit is the most effective way to shape your beard and put rouge hairs to rest. NO MESS APPLICATION: Love your favourite oils and balms; hate the oily mess? Our brush and comb make application a clean breeze. MORE FOR LESS – This Value Pack consists out of 2 100% Natural products for Greatness. 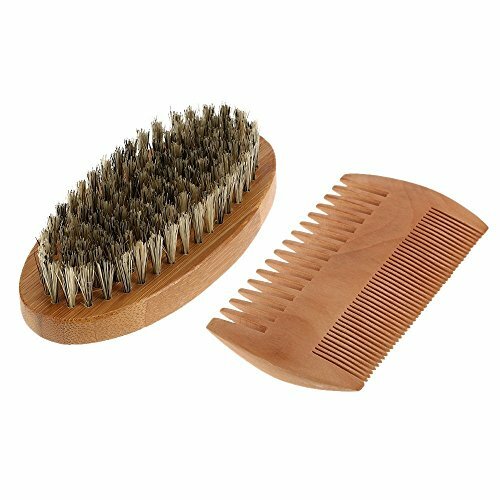 A Wooden Beard Comb & Hose Hair Bristle Brush. 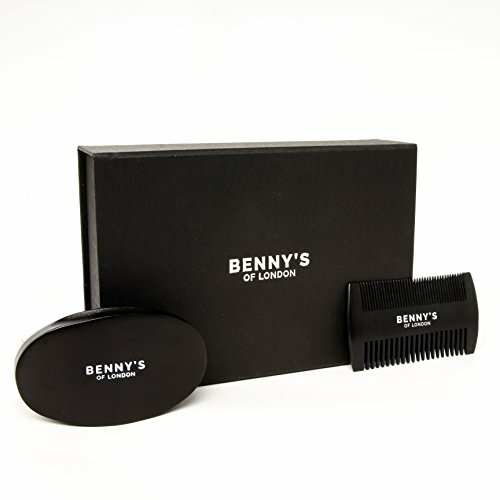 The Comb comes with a PU Leather Case and the Brush goes with a round Metal Crafted storage box. EXCELLENT SHAPES – The comb has two sides, One side has particularly fine teeth for combing & unknitting your beard. The other side has teeth in standard size which is for styling. The Brush has a round and convenient handle, this is particularly handy and allows for comfortable brushing. 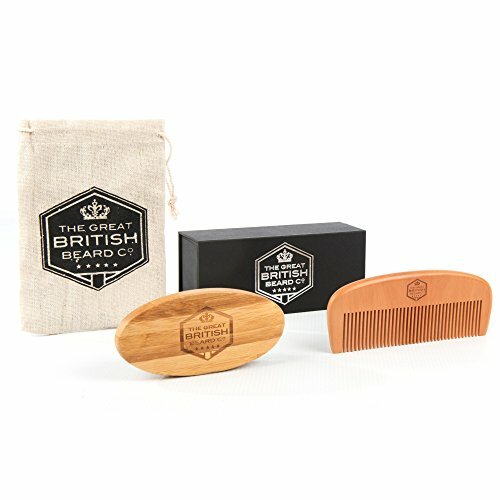 HIGH-QUALITY MATERIAL – The Beard Comb & Brush are made of high-quality sandalwood and Horse bristles, 100% natural. 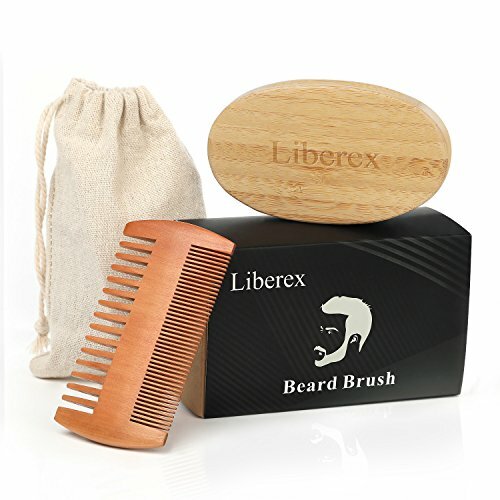 The wood has a look and feel which is completely natural and the finish of these products makes sure the material feels great for your beard but also in your hand. ✅ BEARD COMB ➜ This beard comb is a second asset for a proper care of your beard. 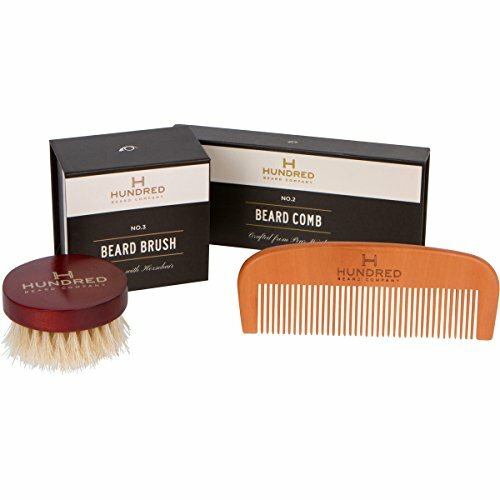 This beard comb ensures a well groomed and smoothed beard. This beard comb eases styling and shapes your beard. 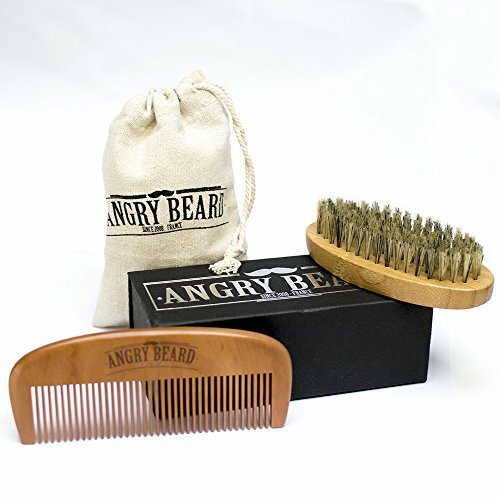 Natural Sandalwood beard comb can be used alongside as a moustache comb and even for your hair.